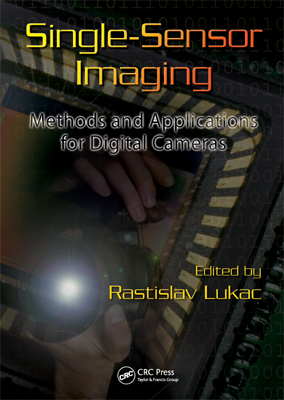 A new book on Single-Sensor Digital Color Imaging published! Explore a Fast-Evolving Technology! A Decade of Extraordinary Growth! Experts Address Challenges and Trends! A Solid Foundation of Knowledge to Solve Problems! Audience: Scientists and development engineers involved with digital image processing, computer engineering, computer science, biomedical engineering, digital imaging, digital signal processing, computer vision, multimedia, visual communication systems, applied physics, acoustics, and applications including digital TV, image-enabled consumer electronics, games industry, satellite imagery, defense systems, remote sensing, art, and medical imaging. The past decade has brought a surge of growth in the technologies for digital color imaging, multidimensional signal processing, and visual scene analysis. These advances have been crucial to developing new camera-driven applications and commercial products in digital photography. Single-Sensor Imaging: Methods and Applications for Digital Cameras embraces this extraordinary progress, comprehensively covering state-of-the-art systems, processing techniques, and emerging applications. Single-Sensor Imaging: Methods and Applications for Digital Cameras builds a strong fundamental understanding of theory and methods for solving many of today’s most interesting and challenging problems in digital color image and video acquisition, analysis, processing, and storage. A broad survey of the existing solutions and relevant literature makes this book a valuable resource both for researchers and those applying rapidly evolving digital camera technologies. Additional material is available at the companion web site www.colorimageprocessing.org.